Hu Keyi is one of China's shipbuilders in the eye of the storm of the economic crisis. The 47-year-old is chief engineer at Jiangnan Shipyard, one of China's oldest shipbuilders based in Shanghai. The company, which employs 10,500, has seen its gross profits on its ships fall by 75 percent since the beginning of the economic crisis. Jiangnan is far from alone. 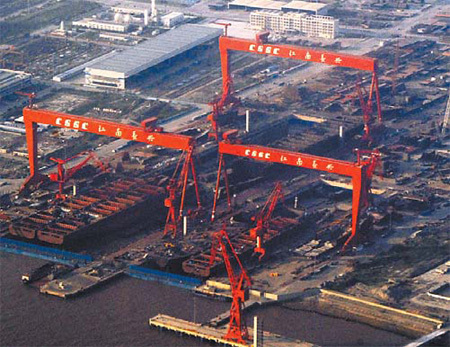 In the first nine months of this year, new orders received by China's shipbuilding yards were 16.9 million deadweight tons, a massive 70 percent drop from 57.2 million tons in the same period last year, according to the China Association of the National Shipbuilding Industry. Hu said new orders from shipping lines from around the world have all but dried up. "We almost don't have any orders from abroad at the moment. We still have orders coming in from domestic State-owned companies and also from some private companies. They are trying to grab good ships at historically low prices," he said. 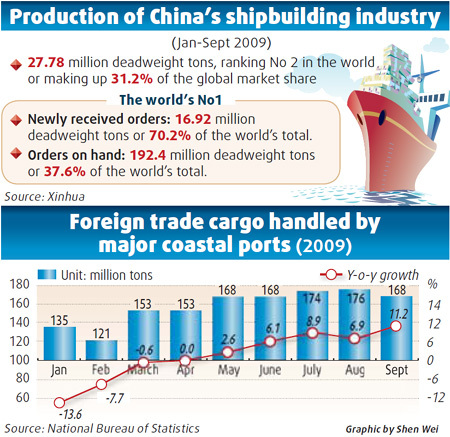 China's shipbuilding industry has been hit hard by the slump in world trade. According to the World Trade Organization, international trade in and out of China fell by 20 percent in the first nine months of this year and by 17 percent across the globe. According to the Chinese Ministry of Transport, container throughput into the country was down 7 percent from 126 million teus (container units) last year to 117 million teus this year. A cold wind is also blowing across the 3 sq km shipyards at Liaoning Marine and Offshore Industrial Park on the western edges of Yingkou City in Liaoning province. "China's shipbuilders need to hug to keep warm. We need to come together and cut costs so as to continue our operations," said Sun Jimin, the general manager of the company. "Shipbuilders now have great capital problems. I hope the government can come up with a policy to promote buyers' credit so that they can make orders. I am waiting for a big order of four ships from Britain. It would be good if our government could lend money to our buyers," Sun said. Meanwhile, Liaoning is slashing the price of its ships by as much as 40 percent in a bid to find orders. "We are reducing the price of ships sharply in a bid to find new buyers. Ships that might have cost $50 million are now being priced at $30 million, but still we don't have any orders right now," Sun said. He said the current situation is in huge contrast with last year, when trade was booming. "We were very busy then, but now it is very different. It is no longer a problem of how to make money but about how to reduce losses," Sun said. Analysts estimate that the combined losses this year of shipping lines will be some $20 billion. Losses in the first six months of this year already make depressing reading for the carriers. The Japanese shipping line NYK has reported a net loss of $694 million, the German Hapag-Lloyd line $680 million, China's State-owned giant Cosco $671 million and APM-Maersk of Denmark $706 million. The number of ships laid up in locations around the world, including a whole ghost fleet off the coast of Singapore, is now attracting international attention. As of October, it was estimated that some 10.7 percent of the world's container capacity is now laid up, a total of some 500 ships. Some in the industry have called for drastic emergency measures to breathe new life into the shipbuilding industry. Gao Yanming, chairman of Hebei Ocean Shipping Co, based in Qinhuangdao in Hebei, said he believes the world's shipping industry is on a precipice. Gao recently told the World Shipping Summit in Qingdao that the Baltic Dry Index (BDI), the measure that tracks world shipping prices and which has recently rallied to above 4,300, must not fall further. "If the BDI falls below 3,000, the market will fall into hell, " he said. And he called for all ships more than 23 years old to be scrapped in order to reduce capacity and give new life to shipbuilders. "The more we scrap, the better the market will be," Gao said. The major problem facing world shipbuilders is what to do with the capacity they have built up over recent years. Global shipyard capacity is set to increase by 161 percent from 26 million compensated gross tons (cgt) in 2005 to 68 million cgt in 2011. The problem is even worse in China, with capacity set to increase by 525 percent over the same period from 4 million cgt to 25 million cgt. Arthur Bowring, managing director of the Hong Kong Shipowners Association, said the industry has been hit by a massive "double whammy" of overcapacity combined with the most severe economic crisis in 70 years. "We have had a rapid build-up of world trade over the past few years, which resulted in fantastic returns for those operating ships. Because of the massive amounts of cargo being moved, new ships were ordered which encouraged shipyards to increase capacity," he said. "Then, of course, we had the economic crisis, which has led to a total drying up of export credit. The two things coming together has led us all into a bit of a mess." Wei Jiafu, president and chief executive officer of Cosco, the State-owned shipping line, said increasing globalization has contributed to the problems facing the world's shipping industry. "Just like a coin has two sides, globalization helps to stimulate shipping prosperity from one side. From the other side, globalization has also played a role with the US subprime crisis becoming a world financial crisis and heavily striking trade and shipping." But Andre Toet, chief operations officer of the Port of Rotterdam, who has long experience in the industry, said problems have been greater in previous economic downturns. "I don't think it is the deepest recession I have seen in my career. The speed with which it occurred is certainly unprecedented," he said. Toet said that although there are overcapacity problems in China, it is still likely to be the engine of any shipping recovery. "China has such a prominent place in global shipping and trade. That is where we are looking for growth, " he said. Apart from scrapping, one solution to current overcapacity is for ships to move into super-slow steaming mode. This keeps ships operational and avoids having to lay up ships, which is not only a very costly exercise but also very time-consuming. Slowing down ships also reduces fuel costs, results in lower CO2 emissions and creates greater schedule reliability, since ships can increase their speed if they fall behind. Maersk Line has introduced super-slow steaming to about 200 of its vessels to date, absorbing more than 7 percent capacity in the effective deployment. Tim Smith, chief executive of Maersk Line for North Asia, said it has proven an effective strategy for the current crisis. "Not only does it absorb extra capacity, but we achieve significant cost savings and CO2 emissions reductions," Smith said. Super-slow steaming might help the shipping lines, but it will do little for Chinese shipyards confronting an overcapacity crisis. Some believe the most effective solution would be to turn much of this capacity over to recycling ships. Ships can be taken apart with the steel being turned into steel rods for the construction industry, lessening China's dependence on imported iron ore. The engines of ships can also be reused in power generation plants. Bowring of the Hong Kong Shipowners Association said it would be an effective use of all the excess capacity. "It would give the industry something to do for the next 10 years, and it would mean it would be well placed for when the demand for new ships does pick up again," he said. "You preserve all the skills of your labor force, and you give the industry the chance to catch up with itself again." Although the world's shipping industry has been seriously thrown off kilter, a quick upturn in the world economy next year could go a long way to restoring equilibrium. Wei of Cosco said that no one should rule out the prospect of a possible rapid increase in trade. "Year-on-year GDP growth in the first six months reached 7.7 percent. Moreover, industrial production growth has been accelerating. Although it is too early to conclude that the global depression is over, the fast V shape recovery is not impossible," he said. 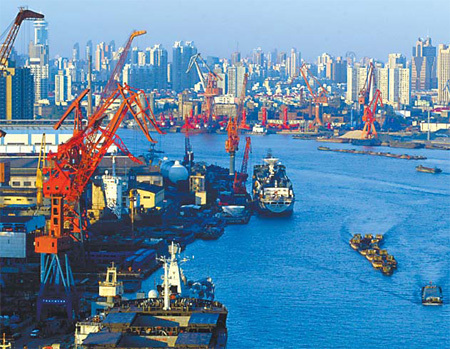 Megan McCurdy, head of marine research and consulting activities at Poten & Partners, the New York-based broker and adviser for the shipping industry, said she believes the effects of China's 4 trillion yuan stimulus package could help restore the country's shipping industry. "Cash injections by certain governments will help support the shipping industry in certain markets, particularly in the East, " she said. Some of this optimism is not currently shared by those running China's shipyards. Sun of Liaoning Marine and Offshore Industrial Park, which has witnessed few crises like this since it was formed in 1865, said it could be a long time before the industry gets back on its feet after the blow it has been delivered. "We have been knocked down. The economic crisis is a huge, huge blow for us," he said. Hu of Jiangnan Shipyard said companies like his are being forced to fall back on all their reserves. "This tough moment requires us to depend more on ourselves. We need to cut costs by any means we can. The industry still depends on the market situation. If the market recovers, the industry will get back to normal," he said.